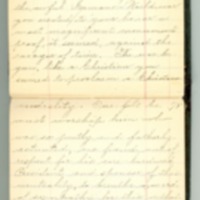 James W. Kisling writes to President Woodrow Wilson about his neutrality position. Copy of a Letter addressed by me to President Woodrow Wilson, Executive Mansion, Washington, DC, June 12?, in unimportant details perhaps variant from the original. Through your magnificent services to your country prior to the awful Germans-World war you erected to your honor a most magnificent monument proof, it seemed, against the ravages of time. The war begun, like a Christian you seemed to proclaim a Christian neutrality. One felt he must worship him who was so justly and fatherly actuated; one feared, out of respect for his care-burdened President and sponsor of this neutrality, to breathe a word of sympathy for this or that belligerent. But, with the official constructional development of “neutrality,” as if the pole-star of righteousness had shifted to the nadir of unrighteousness, our Chief Executive, it seems, has followed the star of reversed indication, and the revered sponsor of “neutrality” has turned its greatest profaner. Aren't you, Mr. President, in your most unjust treatment of Germany trying to erect another monument sprung from the corpses of German patriots, to the glory of insatiable and infuriated English greed, to a monument of dishonor whose very enormity will obliterate the splendor of the other well-earned one? For after all our mental estimates, themselves complexes of comparisons, are subject to change under the environs of other creations of the discriminating function. Mr. President, it pains me to speak so disparagingly of you whom I admired so much before. But it pains me more to contemplate the awful misery that is attendant upon your willful attitude so hostile to the friendly Germans; and when a friend of mine parts with justice in such momentous affairs, I part with my friend. Can it be you have been intoxicated by the venom of the corrupt and venal American press! Their nefarious lying and diabolical machinations of other colors certainly have poisoned the minds of many American laymen. Or can it be race hatred that causes you to err so grievously! You act the flunky to our inveterate enemy the English; you act the bully to our old friend, the Germans. To your proposals to the English that they yield in things the grounds of the German submarine warfare, the English bluntly replied, no. To synchronous and reciprocal proposals to the Germans, these quickly said, we will if the English will.” But for this British obstinacy, a snare for our embroilment with Germany, we would not have on hand the Lusitania case. And yet, in the tribunal of force to which you have referred this case the cause of it is given no cognizance. A tribunal in which effects severed from their causes alone are considered must be a carnival of injustice! You, with base ingratitude, insult and sophistic perversion of the truth, censured the German embassy for its irregularity in notifying intending passengers of that ill-destined vessel that their lives were in danger on board of it on account of a probable attack by German submarines. Now you and your yellow journals call it “murder”! But if the President of the United States had been as “irregular” as the German ambassador, or as “irregular” as the same President was when he advised Americans to leave Mexico (and he is to be commended for that irregularity) Americans might have heeded his friendly caution instead of having cursed the humane consideration of the Germans, and the Lusitania case would scarcely now, if a case at all, be so difficult a case. Moreover, does not the law of self-preservation contravene every other law of human origin! Aren't you trying to deprive the Germans of the protection this supreme law offers, through some of your contentions in the diplomatic submarine controversy? Isn't that an inflated, immoral, unchristian right you insist upon, the right of Americans to travel wherever and however they please, the right which carries with it the incidental right of helping, by so traveling, a warring nation to murder another, a friendly nation, moreover, to us? Am I not only justified in trying to save my life to take the life of one who is trying to murder me, but also to take the life of another who for the time shields the person of the man who through this intervention would afterwards take my life? And if an individual is so justified, why not a collection of individuals, a nation when this is likewise threatened? And wasn't it a ruse de guerre that induced conceited, foolhardy Americans to take passage on the Lusitania? Besides, not a few believe that we would not now be in imminent danger of war with Germany if among those passenger fools had not been some very rich Americans. And will you now out of consideration for those who in disregard for your personal and their country's welfare embarked on the Lusitania, will you bring home the process of widow and orphan making now taking place in Europe and the other continents? Yours has been a most unique opportunity to set in action the forces of Christianity on the grandest scale the world has ever seen, but—Oh what awful scenes, the result of your dereliction! Kisling, James Wellington, “James Wellington Kisling to Woodrow Wilson,” 1915 June 12, WWP22640, James W. Kisling Collection, Woodrow Wilson Presidential Library & Museum, Staunton, Virginia.